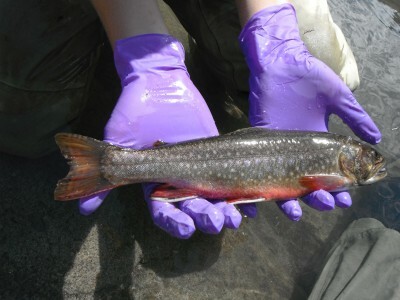 A National Park Service researcher holds a brook trout in Mount Rainier National Park. Low levels of mercury found in fish from National Parks in Western States. Photo Credit: Collin Eagles-Smith, USGS. U.S. Geological Survey (USGS) and National Park Service (NPS) scientists collaborated in the first study to measure mercury in fish from remote places in 21 National Parks spanning 10 Western States, including Alaska. Mercury levels in fish generally were low, but were elevated in some local areas, including two parks in Utah and Alaska where samples taken from sport fish exceeded the U.S. Environmental Protection Agency's human health criterion. Results of sample analyses indicate that mercury in the aquatic ecosystems of western national parks is variable and widespread, but in general, the health risk is low for both fish and people. This study was funded by the National Park Service's Air Resources Division and the USGS Contaminant Biology Program. Mercury in fishes from 21 National Parks in the western United States--Inter and intra-park variation in concentrations and ecological risk: U.S. Geological Survey Open-File Report 2014-1051, 2014, 54 p.